For simplicity animations are shown with PH3 and SnH3 instead of PR3 and SnR3 respectively. The Carbonylative Kosugi-Migita-Stille reaction, commonly known as the carbonylative Stille coupling, is the palladium-catalysed coupling of carbon monoxide and vinylic systems using organostannanes. 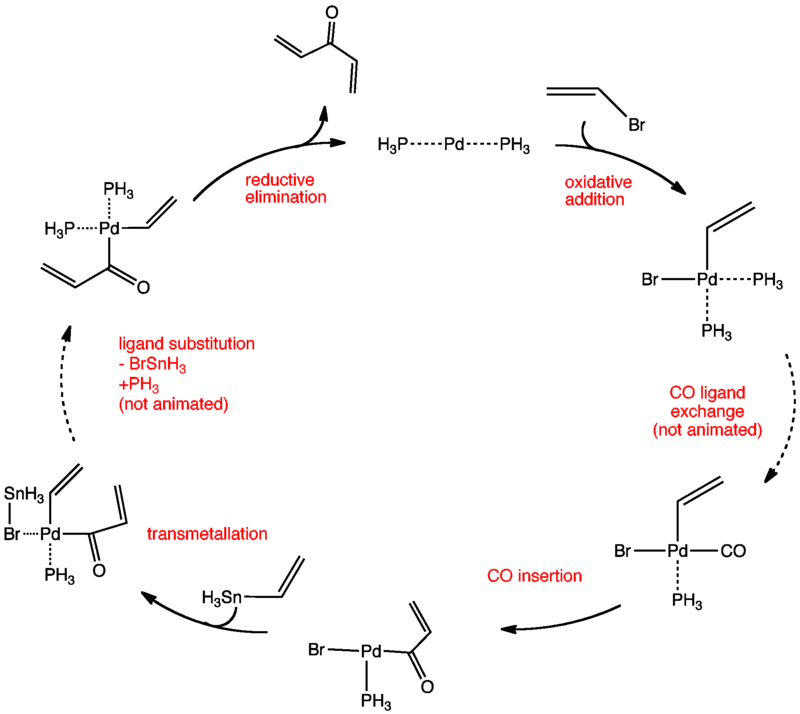 The mechanism involves the oxidative addition of vinyl or aromatic triflate or halide to give a palladium intermediate, which undergoes a carbonylation reaction. The carbon monoxide first exchanges for one of the phosphines and then rapid insertion produces an acyl palladium (II) complex. Then a transmetallation reaction (rate-determining step) with the organostannane to give an organopalladium intermediate. This complex then undergoes a reductive elimination step, giving the divinyl ketone product and regenerating the palladium(0) catalyst. J. K. Stille, Pure Appl. Chem., 1985, 57, 1771–1780.